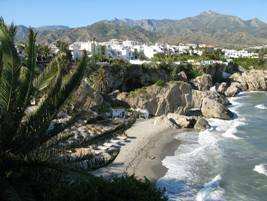 One of the main attractions of Nerja has to be its coastline. In this region the foothills of the Sierra Almijara mountain range reach right down to the shore, forming majestic cliffs between which nestle picturesque coves and beaches, incidentally precluding the erection of the high-rise apartment and hotel blocks which characterise so many other towns. Nerja town centre has preserved its traditional Andalucian construction. In many tourist resorts, economic development has taken place and changes have been made in order to accommodate the arrival of mass tourism, transforming the houses and streets of entire towns, and almost always for the worse. Nerja, however, has not only conserved its original structure, but all new constructions have been adapted to the traditional Andalucian style of whitewashed houses, windows with grills, terracotta tiled roofs, etc. The nerve centre of Nerja is the Balcón de Europa, a favourite site with local people and visitors alike. The promenade, flanked on the left by lovely arches, and on the right by hotels, bars and restaurants, ends at a semi-circular viewpoint on the cliff-top, commanding magnificent views over the Mediterranean and the surrounding mountains. Sunset seen from the Balcón de Europa is unforgettable. The promenade is lined with palms and plane trees, and two ancient cannons form a reminder that until 1812 there was a fortress at the top of the cliffs. At the opposite end, turning left, is a square containing the church of El Salvador. Between the Calahonda and the Carabeo beaches runs the Paseo de Los Carabineros, a delightful natural pathway amongst the rocks of the coastline. Further east are the Jardines de Europa, charming botanical gardens which slope down to the Playa de Burriana. The land around Nerja is reserved for agriculture, and the town and its surroundings are kept marvellously green thanks to the abundance of natural springs and wells. Indeed the name Nerja is derived from the Moorish word Narixa, meaning 'rich in water'. The fields are filled with exotic fruits such as chirimoya, avocado, kiwi fruit, figs and bananas, and the range of local vegetables is superb. There are lots of things to do and see in the town. You can while away a few hours just meandering around the streets and browsing in the many shops, or visiting one of the six beaches, or just sitting outside one of the many lovely cafe-bars, with a drink and tapas. Each Tuesday, the town hosts a traditional market with stalls selling virtually everything - fresh foodstuffs, all types of clothing for adults and children, watches and jewellery, soft furnishings, pictures, music, kitchenware, cosmetics and general household items. Tennis, volleyball, squash and golf are available in the town or within comfortable reach. There are excellent walking opportunities in the mountains, as well as horse-riding and 4x4 excursions. A car is useful for getting around the town - although it is still sufficiently small to walk from end to the other - in addition to allowing you readily to visit such places as Granada (with its famous Alhambra Palace) and Frigiliana - a beautiful Andalucian 'white' village just 7 kms out of town - and the famous Nerja caves (3 kms) which are some of the finest in Europe. From November to Easter time, the fine ski resorts of the Sierra Nevada are within a two hour drive and offer excellent facilities for skiers of all levels at very reasonable prices. Most important of all, despite being one of the Costa del Sol's premier resorts - and one that is visited and lively all year round - Nerja has managed to assimilate this tourism without damage to its basic character as a small Spanish agricultural and fishing village. If you speak Spanish you'll find plenty of opportunity to do so, and this will be appreciated by the locals, but if you don't then you'll still get by without any problems. 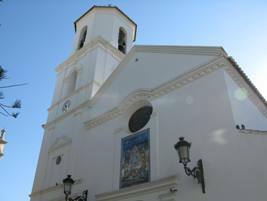 Click here to read about different areas of Nerja.